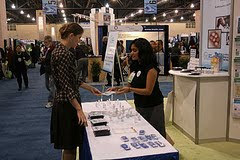 APHA Annual Meeting Blog: Public health swag! If you thought you were overwhelmed by the phonebook-sized schedule you were handed at registration, wait until you check out the Public Health Expo. There’s a lot to see and do, and you might even see the U.S. surgeon general milling about — I just did! I can’t begin to do the expo justice in a short blog entry — but there are plenty of free goodies to be found. Perhaps not surprisingly, a hot item this year is hand sanitizers in every size and shape imaginable. Luckily, I managed to skirt by the Stata booth, a statistics software business, without too many terrible flashbacks from biostatistics class. No offense to the fine people staffing the booth, I just couldn’t bring myself to linger there. But, here are a few highlights I would suggest checking out. If you’re a job seeker, network with some of the organizations offering jobs and fellowships. In particular, the National Biosafety and Biocontainment Training Program was recruiting interested public health graduates, as was the Association of Schools of Public Health. They have a new fellowship in injury prevention and traffic safety that is accepting applications now! If you’re a big Twitter user, the Johns Hopkins University Center for a Livable Future’s booth has a flat screen TV broadcasting conference attendee’s Tweets. The National Library of Medicine offered several demonstration sessions today on recent updates to PubMed and other information resources. Check out their booth for more info if you missed that. You may also score invites to other events at the expo. Physicians for Human Rights is hosting a reception tomorrow from 6:30 p.m. to 8 p.m. in room 403 at the Marriott. It’s open to all with free food and drink as well as great conversation on health and human rights. No need to hold an MD to get involved — the group is looking for new members from all areas of public health. What did you enjoy at the expo? Tell us about your organization’s booth!